Topics: Raised Floors, Pedestal Systems, Raised Floor Accessories, Laminate Colors, and Repair And Maintenance. Age: It went live on March 13th 2002, making it over 16 years, 1 months old. auth1.ns.nyi.net, and auth2.ns.nyi.net are its DNS Nameservers. It is hosted by The New York Internet Company (New York, York,) using Apache web server. 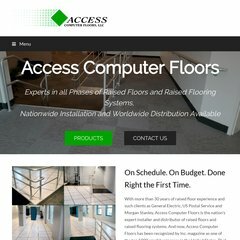 Access-computer-floors.com's IP address is 64.147.103.2.